Biloxi, Mississippi after Hurricane Katrina. Photo by NOAA Images/Flickr. In this episode of the WRI Podcast, Christina DeConcini, director of government affairs at WRI, and Forbes Tompkins, research analyst in the Global Climate Program, sit down with Lawrence McDonald to discuss what exactly local communities are doing to prepare for sea level rise and extreme weather events. They delve into the new WRI policy roadmap that lays out opportunities for Congress and the Trump administration to protect homes and jobs, build infrastructure that lasts, preserve tourist towns, safeguard military bases, and ensure the longevity of ports that bridge the economies of the coast and heartland. Sea level rise and extreme weather events – like Hurricane Sandy’s devastation in New Jersey and the more frequent and paralyzing inundations around Florida’s coastline – are issues that increasingly plague the United States. These climate risks threaten the 123 million Americans living in coastal cities (who generate nearly half of the country's GDP), and show no sign of letting down. In a time of political polarization, mayors and local elected officials across the United States are addressing climate impacts regardless of their party affiliation. These officials are directly accountable to the citizens on whose shoulders fall the economic and community impacts of climate change. But while they have taken action to build resiliency to the risks, they cannot address this issue alone. Support from the federal government is vital. The new policy roadmap from the World Resources Institute, Roadmap to Support Local Climate Resilience: Lessons from the Rising Tides Summit, presents eight timely federal recommendations to protect U.S. communities and the economy from costly sea level rise, disruptive coastal flooding and devastating extreme weather events. The Rising Tides Summit last year brought together the largest bipartisan gathering of U.S. mayors and local elected officials to discuss how we respond to mounting climate impacts. 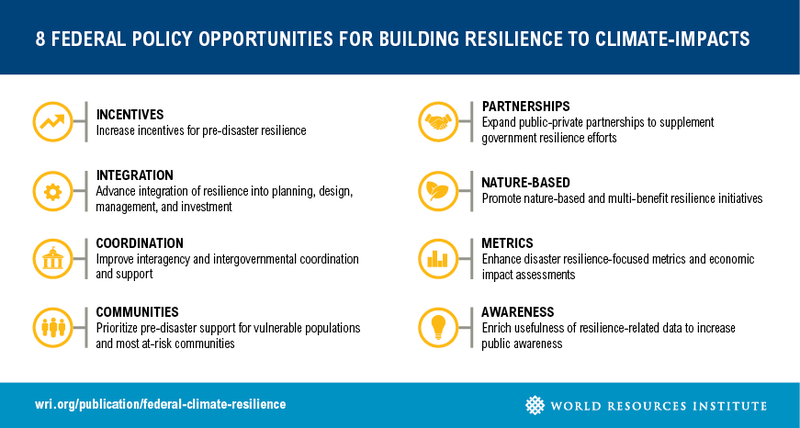 As the Trump administration prepares to invest in infrastructure, they would do well to incorporate climate resiliency at the core of their efforts. Doing so will save taxpayer dollars and keep investments from washing away with the tide. You can listen to the podcast here, as well as find previous episodes of WRI Podcast on our Soundcloud. PODCAST: What Does the US Stand to Lose if it Pulls Out of the Paris Agreement?